Since 1977 Mitchell Ellis has been providing machinery specially developed for the nursery and greenhouse market. With increasing labor costs and stricter immigration laws, The EZ Potter has made potting plants easier. Old style potting machines have too many parts and can be very expensive. Basic designs for these machines haven’t changed in over 30 years. The EZ Potter has changed all of that. With much more efficient mechanics and an easy-to-use design. Contact us today to get started with YOUR EZ Potter! 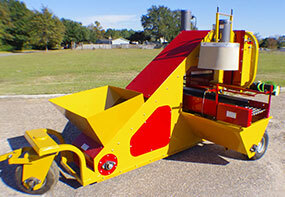 We have built horticulture equipment for the nursery industry for over 30 years. Our line of products are of the best quality and workmanship in the marketplace today. Our products include: potting systems, peat shredder, flat filler, coirbuster, soil mixer, conveyors, hoppers, shipping carts, retail carts, flat carts, tracking wagons, tree dollies, pot stabilizers and tomato baskets. Your Event Showcase: Plan for Success & Stay Connected! Register to Exhibit/Sponsor @ Shows and Let's Market your Event Invitations, Booth Promotions!